dude this is amazing! I need to get like you! welldone. thanks for sharing your process! Wau! Good! Very good... expressive! Kind of like following up a series of paintings of lambs with a depiction of a slavering wolf. It's a great portrait, though! Great piece Chris! Kinda grotesque. I cant stand Charlie Sheen and '2 and a half men stinks'. So I think this portrayal of him is fitting!! Amazing as usual ! It's an unusual vison of Charlie Sheen but i think it suit very well the glimpse of his private life we can hear trough the medias. In other words it's kind of his dark side :)Your step by step is also very interesting ! is amazing ... the colors are magnificent! Hey, cool blog man!!! 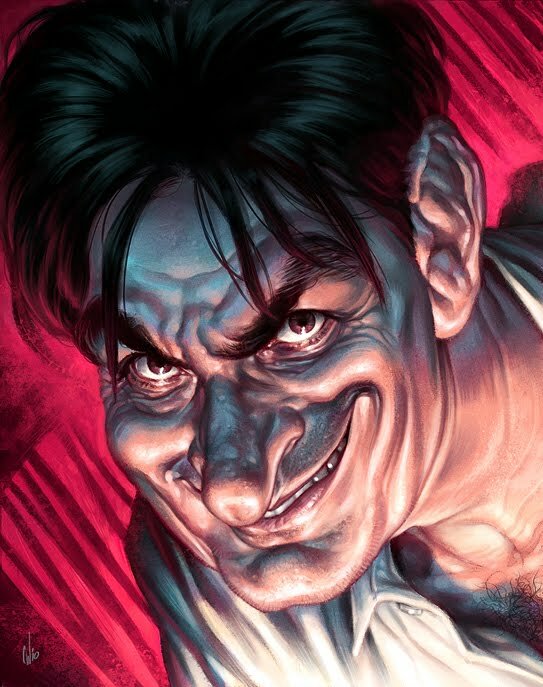 This Charlie Sheen painting is very cool!!! That's a wonderful Charlie Sheen Chris - superb, almost 3D. Years ago, one of my friends was on holiday around where they filmed 'The 3 muskateers' starring Kiefer Sutherland and Charlie Sheen. She made friends with one of the crew and they were hanging around the set one evening when a stretch limo pulled up and 3 girls got out- blond, brunette, redhead - all in catsuits and shades. "Who are they?Are they actresses?" said my friend. "No" said the crew guy, "They're entertainment for Mr Sheen". That is so damn creepy. Amazing work, Chris! can you say " ART GOD"? I can. So perfect! You're one of my favorite caricaturists working today and I am in awe of your talent. Like the quick caricature of him in the tutorial a lot as well! Just found your work through teefury. I love your illustrations! Delightfully creepy and well captured! Hermano, realmente impresionante. me alegra el poder difrutar de tu arte, excelente. Mark Edward Light- That's a great story. Thanks for sharing!